Posted by WorldbyStorm in Economy, Irish Politics, Uncategorized. There’s an interesting and even useful piece by senior policy analyst Paul Joyce of the Free Legal Advice Centres on the current state of mortgage default. As he notes the report by the Expert Group on Repossesions was released quietly this month by the Department of Justice. And it brief was to assess the appropriateness or otherwise of statutory repossession processes in the Irish courts. … [this was in the context of] the troika’s concern with what it saw as abnormally low rate of repossessions in Ireland and the lengthy complicated and expensive repossessions system. As he also notes, unsurprisingly while the report has a certain rhetorical sympathy for borrowers its findings are essentially behind lenders in large part in order that ‘funding be made available for the purchase of residential and other property’. As Joyce asks, how can a new boom to bust be avoided in such a context? …critically, those in the long-term over two years arrears category increased by almost 3,000 to almost 32,000 accounts, with an average arrears amount of more than €40,000. …the evidence indicates that we still have a very deep arrears problem that is being resolved far too slowly at a time when the gates have opened to potential repossession. And he argues that write-downs are ‘sporadic and confidential’ while ‘it is open to question how sustainable a number of restructured mortgages will be over time’. I’ve noted previously that one major problem is what happens when interest rates go up – and the question arose as to why they would. There appears to be a general consensus amongst those that are observers in the area that they inevitably will over the next number of years if only because they are at historically low levels. Obviously for those already in trouble this is bad news further exacerbating their woes, but for an halo of others who are just about getting by now this is deeply problematic as they see their mortgages slip into arrears. Finally, Joyce makes a counter-argument to those who argue that many of these problems were self-induced. With 90,000 plus households awaiting social housing and mortgage-rent schemes that have only delivered a small number of results of of a far larger number of applications, a spate of repossessions would neither be advisable nor fair to the many who borrowed to buy family homes, as they were encouraged to by both lenders and government. That last is central. I was a bystander to all these processes in the 2000s, watching almost unbelieving as the market heat intensified, advertising to prospective borrowers became ever more extravagant and baroque (remember the adverts directed at those who had their own houses so that they could ‘unlock’ the value in order to assist their offspring to purchase houses?) and as government wasn’t so much asleep at the wheel but was collusive in a process that seemed uniquely designed to prise away as much money [mostly] from those with less than was necessary to sink present and future capital into property, and all this whipped along by an equally collusive media for whom the good times could never end, for whom every scrap of a house on a stamp sized portion of land was a ‘great investment’. There’s been so much written about this, but I can think only of how in Raheny and Kilbarrack strangely shaped houses would spring up on any spare piece of land, the corners of new houses tapering away in improbably acute angles. Personal greed on the part of purchasers? Of course, it was a market. But a massive lack of information as to potential consequences and therefore insufficient data for most to make clear-headed assessments. I’ve mentioned before how later on – after all the crisis had broken – I had to borrow some money for work on the house I live in and during the stress testing was told quite frankly by the people loaning it that even though on paper all looked grand, it wasn’t a large sum, even still there was a risk, that there was always a risk. There’s a lesson in that, but what is the lesson and what is the chances that it will be heard in a society where the media and political and economic circles argue so trenchantly that house-owning is some combination of virtue and necessity. Look back at Joyce’s point about the paucity of mortgage-rent schemes and the insufficiency of social housing programmes. The expert group seems to envisage resurgence in the mortgage market thought it is arguably cash buyers and investors who are driving demand. Curiously, there is nothing in its report on some of the causes of the crisis in the first place – the privatisation of the housing market, government over-reliance on stamp-duty revenues, regulatory inaction and lender greed resulting in reckless credit provision. A proper state social housing policy, ethical and affordable lending (and borrowing) standards an deregulation with teeth will all be required. Sometimes it seems, though that the institutions in control when the mess was created are the ones exclusively charged with plotting a way out. …a document that went up in the past. This week, Socialists Against Nationalism, from 1979, a lash-up between the Limerick Socialist Organisation, BICO and the 1970s Socialist Party of Ireland. All the greats – eh? A short document this week only four pages long. 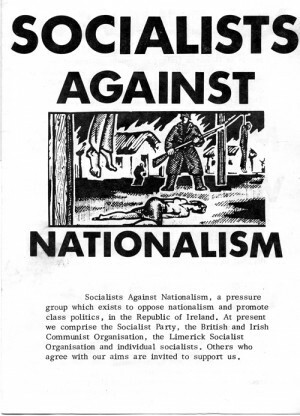 Socialists Against Nationalism, a ‘campaign’ group established in the late 1970s/early 1980s by the Socialist Party of Ireland (not, I hasten to add the current SP), the British and Irish Communist Organisation, the Limerick Socialist Organisation and ‘individual socialists’. As far as can be determined this was the precursor of the Democratic Socialist Party, led by Jim Kemmy, which later merged with the Labour Party. As a campaign how long it lasted and how successful it was is unclear. Although as regards the latter point it is worth reflecting on how many a left (or later liberal or right-wing) Irish political career clearly drew a degree of inspiration from the sort of analysis put forward here, that the only way to working class unity was by eschewing the ‘call for a 32 county Socialist Republic [which] is nothing more than the old nationalism newly dressed in a socialist guise’. Actually that in itself is a remarkable statement from an avowedly left-wing body given the longevity of the socialist Republican approach in Irish politics during the 20th century. But then again, considering issues of success or failure, some the central ‘demands’ in the leaflet have been fulfilled – look at the list on page 3- although their avowed aim of extirpating ‘nationalism’ has not. But then consider again the image on page 1 which makes a clear visual linkage between the most extreme form of ‘nationalism’ and Irish nationalism. Hard in that context to take entirely seriously their idea that they wanted to ‘organise public debates with socialists and others who still hold the traditional nationalist viewpoint’, or indeed that ‘traditional nationalism’ equated with what appears to be a pogrom. And consider again the viewpoints expressed in the recent past on various historical issues which chime with that sort of viewpoint. I can find reference to them in Seanad debate here (John A. Murphy giving an interesting analysis) and here. Any further information on this campaign would be of considerable interest, as would any material from the DSP. We live in a very liberal society with shifting values. What is appropriate behaviour is not at all clear in many circumstances particularly across generations. We also have no consistent measure of harm. This is puzzling. Let’s put the instance of Rennard aside and let’s look at the broader issue of ‘inappropriate touching’ (which is what led to complaints). At what point in contemporary or near contemporary society has it been appropriate for a man to inappropriately touch a woman? At no time in my adult lifetime, and even quite some while before, has that been (formally) acceptable – whatever about the de facto situation in certain contexts (I remember myself seeing directly how a similar case was dealt with in one place in the late 1980s where there was a tendency minimise and laugh away the harm of it and the effects on those who had to endure it and to sweep it under the carpet. But even there and then it was clear it was not publicly accepted or owned up to – even if there was a dismal level of de facto tolerance). So where is this lack of clarity Goodhart appears to refer to? She died 30 years ago today…. 1. In 1969 which Fianna Fail TD declared that the Labour Party had been taken over by a bunch of “Left Wing political queers from Trinity College and Telifis Eireann”? 2. Which two candidates in the forthcoming Local Elections set up an organisation “People Before Parties” ? 3. In 1978 which TD was expelled from the Fine Gael Parliamentary Party for voting against the Party Whip and abusive behaviour to Nurses protesting at the Dail ? 4. Ted Nealon passed away this week. How many ‘Nealon’s Guides’ were published? 5. Which of the following ran a Dress Design Business prior to becoming a TD, Alice Glenn, Cecilia Keaveney or Liz O’Donnell? 6. In the run up to the 1981 General Election which Minster promised aside from the Airport, an International Sports Complex for the Knock area? 7. What year was Phil Hogan first elected to Kilkenny County Council ? 8. How many of the Sinn Fein candidates elected to Dublin City Council in 2009 have gone on to be TDs? 9. Were Brian Hayes to win a European Seat there will be a by-election in Dublin South West. When was the last By-Election there and who won the seat? Then a leaflet from John Flanagan of People Before Profit (which has a vote Brid Smith bit on the reverse) and also has a piece of an election leaflet I scanned and posted on the front. Then a leaflet from Sean Walsh who is running as a John Halligan Independent in Comeragh in Waterford. Then from the 1972 Referendum on Ireland joining The Common Market , three leaflets urging a No vote from the Common Market Defence Campaign. 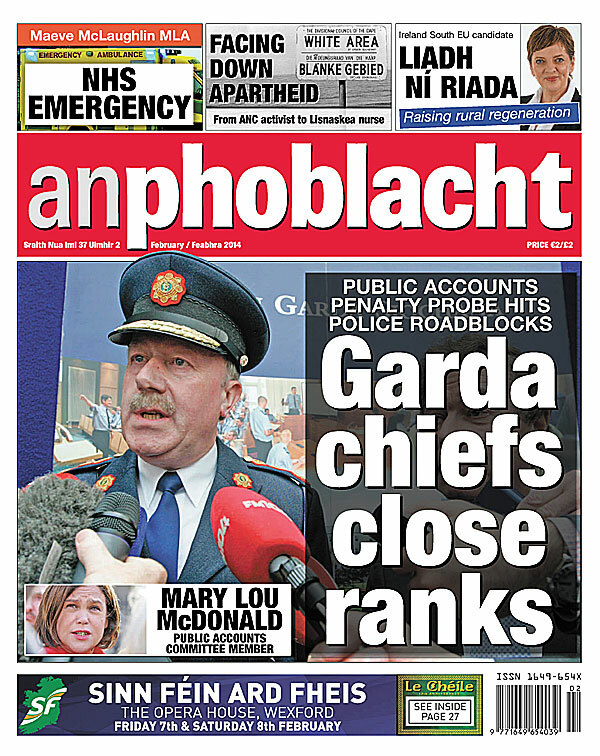 The February edition of An Phoblacht is just rolling off the press and will be in your local newsagent nationwide from Friday morning. Margaretta D’Arcy: Níor chaill bean an mhisnigh ariamh é! Posted by WorldbyStorm in Culture, Irish Politics, The Left. 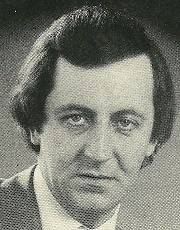 In a letter to the editor of the Wall Street Journal [billionaire investor Tom Perkins, a founding member of the venture capital firm Kleiner Perkins Caufield & Byers] lamented public criticism of the “1 per cent” – and compared such criticism to Nazi attacks on the Jews, suggesting that we are on the road to another Kristallnacht. Extreme inequality, it turns out, creates a class of people who are alarmingly detached from reality – and simultaneously gives them great power. He isn’t even the first finance titan to compare advocates of progressive taxation to Nazis. Back in 2010, Stephen Schwarzman, chairman and chief executive of the Blackstone Group, declared that proposals to eliminate tax loopholes for hedge fund and private-equity managers were “like when Hitler invaded Poland in 1939”. And while the language is less superheated, we see precisely the same dynamic in effect, albeit in a more nuanced way, in the recent interview with Gus Kelly, head of AerCap holdings, mentioned earlier today. And look at how many of those making these accusations also made the ludicrously self-centred claim that their hurt feelings (as opposed to things like household debt and premature fiscal austerity) were the main thing holding the economy back. Absolutely, but let’s take that a step further and one can see how the concentration on how markets ‘feel’ is of a piece with that. Only recently we were treated in the Irish Times to an absurd poll which sought to show the situation was improving in the housing market because when they polled ordinary citizens they thought prices would increase in the next year in Dublin. Of course attitudes have a part to play, but there are basic structural reasons which are significantly more important. And yet in the contorted logic of the market and its cheerleaders, now emerging more and more obviously in to the light of day after something of a four year hiatus, because you or I think (probably correctly) that prices will increase this somehow heralds a ‘recovery’, and in a sense becomes a signifier of evidence of that recovery. It’s almost entirely self-referential in that particular instance, not least because chances are you and I think prices will increase and yet that doesn’t as such herald a recovery. A 0.6 per cent rise in retail sales in December – traditionally the busiest month of the year – has been described as disappointing. The latest figures from the Central Statistics Office (CSO) indicated the volume of retail sales rose by 3 per cent on an annual basis in December. When volatile car sales are stripped out, retail sales rose by 1.3 per cent in December compared with the previous month, and grew by 3 per cent on an annual basis. How this is a surprise escapes me. Let’s dip, with usual caveats applying into the anecdotal. I’d been in and out of Dublin city in the weeks and days before the New Year and just talking to sales workers it was clear from their experience that there was no particular lift on the ground. Another sign, car parks around the city, were hardly any more crowded than they were during the rest of the year. That’s all grand, but it proves nothing. More importantly structurally how could there be a lift in a context where there are increased charges, no particular sign of economic recovery (even if matters have stabilised, which is not exactly the same thing) and where unemployment, static or declining wages are the new natural order of things? Mark Fielding, chief executive of the Irish Small and Medium Enterprises Association, described the figures as “disappointing”, adding that high costs were continuing to “crucify” small retailers. “While the 58,000 new jobs created should be expected to generate new spending, the fact of the matter is that the new wages are being used to pay down pre-existing debt, pay property tax and save for new taxes”. But how could it be otherwise? A private sector that has been pushing for lower paid job creation and the removal of worker protections, again as a part of job ‘creation’, surely cannot be surprised when there’s insufficient return financially from those jobs. And an economy that has been under two successive governments shaped to pay off debts, significant portions of which are effectively private sector debt, is not an economy that is going to see growth prosper in it. And consider that closely, that our socio-economic structure is significantly distorted now precisely to service debt. And in this case as with the larger socio-economic posture, so with the smaller. I was dubious over the New Year at that anecdotal evidence (dubious of my own too – it’s always better to wait for stats to emerge) but to me there was a real sense that the message was being put out that all was well precisely to encourage expenditure. That hasn’t worked. One wonders what will. The SBP have a respectful interview with a millionaire aircraft leasing boss who reckons it’s a big problem that millionaire Aircraft leasing bosses face too high personal txes. You might have thought that was hyperbole, but JP is spot on. Reading the actual interview it is as bad as they suggest. The interview is with Gus Kelly, head of AerCap holdings, a company with, following a takeover of US firm ILFC, ‘€66bn of total assets on its balance sheet, a fleet of 1,300 aircraft and orders for 400 more. This fleet is expected to be registered as Irish, meaning that this country would now be ‘home’ to 55 per cent of the world’s 8,000 leased commercial aircraft, up from 40 per cent’. As the profile notes, ‘good news for Ireland – and another step up the ladder for Gus Kelly’. But it would appear that that is not enough. For although he is happy to discuss transaction fees on the ILFC deal that were €311m, the interview segues into an odd area. It’s not just the AerCap fleet plan that is in the balance. The country’s hard won place leading the industry is also threatened, says Kelly. Aviation leasing is one industry where Ireland has the intellectual capital, not must the financial capital. And intellectual capital is what you want. The government needs to be aware how attractive other jurisdictions make it for expatriates. You… don’t want to end up in a situation where this industry becomes what the hedge fund industry is in Ireland. All you have predominantly in that industry in Ireland is back-office admin staff, while all the senior guys are in London or New York – meaning, we are not getting any of the real intellectual capital or income tax payments on high-level salaries. The won’t come here. Why would you come here and pay higher tax rates? It is a natural disincentive for expatriate to come here. The Irish corporate tax rate is very advantageous, the withholding tax treaties are exceptionally advantageous, membership of the EU is a huge plus – but people have to attracted themselves at a personal level. We have to ask ourselves: how attractive is the country for expatriates to come to? Do I want to earn 33% less, and move my family and my children to a foreign country? This is the question people will ask themselves, and it’s a tough equation. Perhaps not quite in the way he thinks.